One way for anchor institutions to support community development and build local wealth is through developing and improving local business capacity. This practice ties directly to local hiring, workforce development, local purchasing and economic inclusion strategies and works to increase economic opportunities for local residents and improve quality of life while also, ultimately, meeting service and purchasing needs for the institution. There are many different ways that institutions can, and do, help to build local business capacity – from establishing revolving loans funds for local entrepreneurs and investing in community development financial institutions to operating business incubators and hosting workshops and training programs for local businesspeople. Investing in revolving loan funds and CDFI’s (or local minority-owned banks) creates a larger pool of funds to lend to local businesses and assists with start-up and operational costs. Improving business capacity through education and training builds on existing assets and creates a cohort of business owners that can support their own communities and help them grow. Strengthening existing community institutions (i.e. not just businesses) can also foster business development. Working to increase the capacity of local nonprofits that support small businesses, such as community development corporations, is another way that anchor institutions foster the growth of local businesses. Lending expertise through volunteering and providing training led by professions from the institution are just two ways that anchor institutions can build the capacity of local nonprofits to build business capacity. Many institutions have a separate division, office or institute devoted to business development and local economic development concerns. As mentioned above, there are many ways that an anchor institution can support the growth and development of local small businesses in their community. Institutionalizing policy measures at the administrative level to support programs that match anchor resources to business development efforts in the community is one way to ensure success. Investing in community development financial institutions and local minority-owned banks. Establishing revolving loan funds to support local entrepreneurs. Operating business incubator facilities that provide safe environments for start-up businesses. Providing workshops, technical assistance and training programs for local entrepreneurs. Strengthening the capacity of and partner with existing local nonprofit institutions and community-based organizations to work with small businesses and work to build on-the-ground capacity within the community. Portland State University’s Business Outreach Program (BOP) began in 1994 with a grant from HUD’s Community Outreach Partnership Centers (COPC) grant. Since its founding the program has supported over 420 small businesses and reported in 2010 that they created 146 jobs at these businesses over a four year period. The program provides technical assistance to women and minority-owned businesses in low-income community. It also offers community-based learning opportunities for undergraduate business students through internships programs that help build long term relationships with business clients. One of BOP’s best known efforts was a contract with Portland’s transit agency, TriMet, to support small business owners impacted by the construction of light rail. Through this project, BOP was able to oversee low –interest loans to 33 local businesses. In 1989, LeMoyne-Owen College established its own community development corporation, the LeMoyne-Owen CDC, through which it runs most of its economic development projects. To support local businesses, the LeMoyne-Owen CDC runs the Business Development Institute, funded the Small Business Administration’s Program for Investment in Micro-Entrepreneurs grant. The Institute offers a free 10-week business course to residents, half of which must be low-income. As of 2010, 800 people have graduated from the program, and 75 businesses and 183 jobs have been created. As part of a local real estate development projects – the Towne Center – the Institute will also offer incubator space to seven emerging small businesses. Additionally, as part of the SBA grant, the LeMoyne-Owens CDC has acted as a micro-lender in the community, despite challenges with repayment. 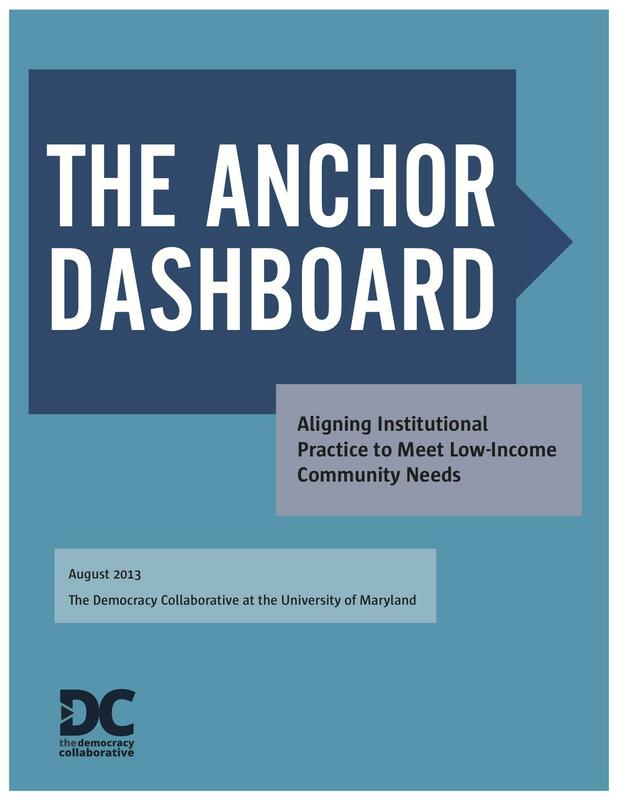 These policy briefs were produced in conjunction with the Democracy Collaborative's paper, The Anchor Dashboard: Aligning Institutional Practice to Meet Low-Income Community Needs.